BRAC is excited to invite you to participate at the 6th Frugal Innovation Forum to be held on March 3-4, 2019 at BRAC CDM, Savar, Dhaka, Bangladesh. The theme of the forum for 2019 is ‘Scaling opportunities for youth’. In this conference, you will not only get the exposure to innovations but we can assure you that meeting and greeting people from diverse backgrounds ranging from google to representations from local youth organizations is going to be an experience to remember and grow from for you. You can have a look at our speakers and agenda of the conference here. You can join us, pitch your big idea and collaborate with people to take that idea forward. It will also be a fantastic opportunity for those from outside of Bangladesh to get a sense of the changing landscape here, and potential opportunities for investment and engagement. We have planned lots of exciting activities and engaging sessions which we believe will be enlightening and worthwhile. All these too with a highly subsidized fee. Please register for the forum here. We will also be arranging a field visit to Cox’s Bazar prior to the conference from March 1-2, 2019 where you can get an exclusive insight of the host community and Rohingya camps. Please register for the field visit here. More about FIF: BRAC held five Frugal Innovation Forum’s till now to create a space for doers to discover and partner for scaling what works, and analyze lessons learned from what doesn’t. It’s grounded in practice, and we pride ourselves in spotlighting initiatives that are truly transformational on the ground, not just in the media. 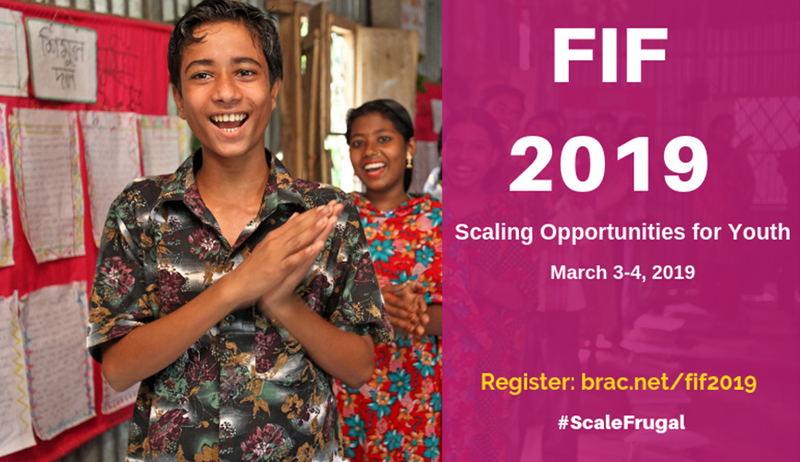 Register now to get an insight of youth opportunity scaling within the global south.